The 6502 is the classic CPU. 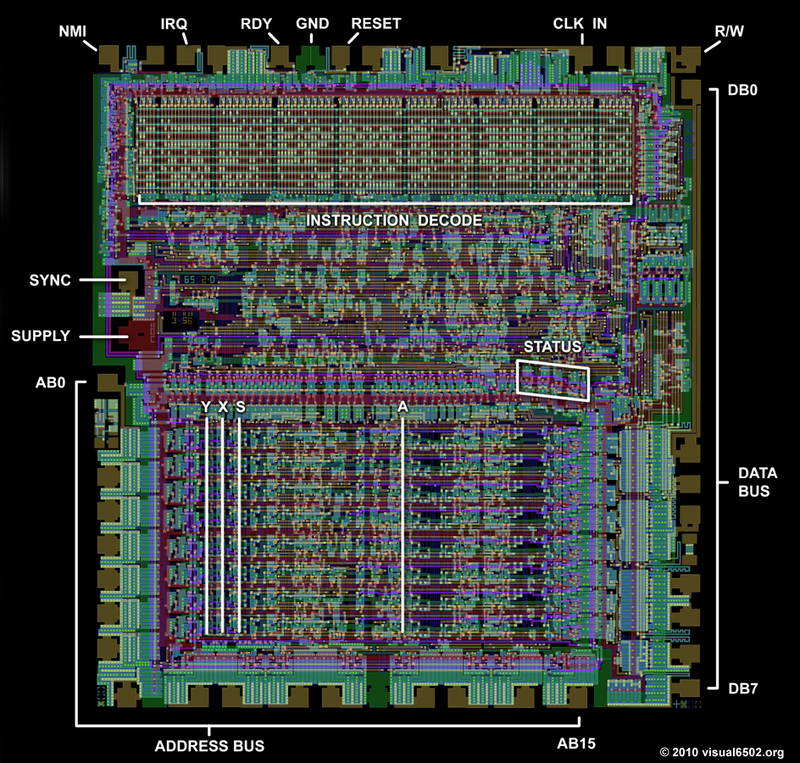 This chip is found in the original Apple, Apple II, PET, Commodore 64, BBC Micro, Atari 2600, and 800, the original Nintendo Entertainment System, Tamagotchis, and Bender Bending Rodriguez. This was the chip that started the microcomputer revolution, and holds a special place in the heart of every nerd and technophile. The 6502 is also possibly the most studied processor, with die shots of polysilicon and metal found in VLSI textbooks and numerous simulators available online. The only thing we haven’t seen, until now, is a version of the 6502 built out of discrete transistors. That’s what [Eric Schlaepfer] has been working on over the past year. It’s huge – 12 inches by 15 inches – has over four thousand individual components, and so far, this thing works. It’s not completely tested, but the preliminary results look good. The MOnSter 6502 began as a thought experiment between [Eric] and [Windell Oskay], the guy behind Evil Mad Scientist and creator of the discrete 555 and dis-integrated 741 kits. After realizing that a few thousand transistors could fit on a single panel, [Eric] grabbed the netlist of the 6502 from Visual6502.org. With the help of several scripts, and placing 4,304 components into a board design, the 6502 was made dis-integrated. If you’re building a CPU made out of discrete components, it only makes sense to add a bunch of LEDs, so [Eric] threw a few of these on the data and address lines. This is the NMOS version of the 6502, not the later, improved CMOS version. As such, this version of the 6502 doesn’t have all the instructions some programs would expect. The NMOS version is slower, more prone to noise, and is not a static CPU. So far, the CPU is not completely tested and [eric] doesn’t expect it to run faster than a few hundred kilohertz, anyway. That means this gigantic CPU can’t be dropped into an Apple II or commodore; these computers need a CPU to run at a specific speed. It will, however, work in a custom development board. Will the gigantic 6502 ever be for sale? That’s undetermined, but given the interest this project will receive it’s a foregone conclusion. This is pretty awesome. I have always wanted to see a mass production CPU like this built out of discreet parts. Now I want to see the Intel 4004. A 386 would be too complicated as it has 275,000 transistors. ~80x what was in the 6502. I wonder if that would then cost between $80K and $400K to manufacture? Considering that the 6502 will be between 1K and 5K… :-) A 12×15″ 4 layer PCB in 100 qty is about $20-30 from the usual cheap Chinese fab houses. Yes I can imagine a 1 meter cube, in a tank with 1000 litres of cooling fluid. Make a cutout in the middle and shorten the wiring traces as much as possible and it sounds vaguely like a Cray 1. What about an 8086 or Z-80? Those could be doable. Where did you get the 275000 transistor number please? I was working for Intel around the time that the 386 was released, and there were posters all over the building crowing about 1 million transistors on the 386. I can’t say for sure that 1e6 is correct, but I am curious where the 275000 number came from. So at a transistor density of 1 per cm the 386 really would take up one cubic meter? Googling “how many transistors in a 80386” gets you 275,000 on many sites, including Wikipedia. Might be Wikipedia is where sites get their source from. Wiki itself quotes a paper from MIT about FPGAs. The 486 apparently had over a million, with it’s cache RAM and FPU, maybe that’s what you’re thinking of. What about a large FPGA? For the Intel 4004: See http://www.4004.com/ There is a photo of a transistor-implementation of an Intel 4004 there. I’ve seen that one before, but as far as the site is concerned and what my own searchings have told me, that’s only a mock up and not a functional 4004 made of discrete logic. Hi, yeah, having one of the earlier chips like the 4004 that came out in 1971, or the 8080 that came out in 1974 before the 6502 came out. I love the Apple II+, but I think the Intel chips that came first in kits like the MITS Altair 8080 computer are what got things started. What would be fun is having this hanging on the wall with a flatscreen monitor above, LEDs tracing the bits as they move through the CPU from register to RAM to display … with a USB cable to my PC running AppleSoft BASIC. Now that would be an education tool. There is the Magic-1 (http://www.homebrewcpu.com/) homemade computer built from TTL logic chips. The 4004 has already been done. Should be able to find pictures on the google. In the early 1980s, the Z80 was the most commonly used CPU of all time, and, along with the MOS Technology 6502 family, dominated the home computer market from the late 1970s to the mid 1980s. It’s worthy to note the NMOS 6502 has about 3500 transistors. the Z80 has 8500. Tripling the count is going to triple the size of the board, and your’e going to start getting serious timing problems. The 6502 also had much better yield from the fab. This is what allowed the 6502 to be profitable at $25 while anything comparable was in the $100-$200 range. I’ve never heard about the better yield. I’d point out that the lure of the 6502, at least initially, was the low single unit price. The others did have a high price initially if bought in quantities of one. Legend has it that when the Altair 8800 hit, it was either the same price as the 8080 or just a bit more. But MITS had to be getting a much lower price, since they included The boards, some ram, the power supply and the front panel on too of the CPU. I remember the article in Byte, the October or November of 1975 issue, that introduced the 6500 (the one pin compatible with the 6800, which was rapidly withdrawn because of a lawsuit from Motorola) and even out the $20 price in the title of the article. That got my attention, which is why I never used an Intel CPU much until 2001, it was 6502/6809/68000. Word has it that Steve Wozniak thought the same thing, which is why the Apple I and II used the 6502. The low single price was thus a lure, but I suspect quantity discount was the same for the 8080 as for the 6502. Memory says that in the fall of 1975, Godbout was selling the 8080, the clock generator, some ram and an eprom for about fifty dollars US. If my memory is about the time is right, that put the 8080 price quite close to the 6502 that fall. I think I heard about the yield in one of the “Oral History of..” on https://www.youtube.com/user/ComputerHistory channel. MOS used same trick Intel was using (and guarded as a trade secret), they retouched their masks after shrinking. I’m bummed that there don’t seem to be any high resolution photos of it. I’d love to take a look at the details of this masterpiece! There are some pretty high-res pictures on the monster6502 site. But you can’t see anything because the stupid blue leds flood the potato camera sensor and make everything else pitch black (very likely to be eaten by grue). Blue leds must be banned. The other CPU that would make some sense to do this way would be the RCA 1802. It’s a little more complex than the 6502 at 5,000 transistors but is a static design meant to require relatively few support components. But can you make the transistor version “radiation hardened” or whatever the term is? They put the 1802 in an “early” amateur radio satellite, maybe OSCAR 7. Someone from AMST gave a talk at the lcl radio club about it, saying the 1802 was chosen because it could live with the radiation in space, and because software could be reloaded without an eprom monitor or lots of external hardware. A discrete transistor version of any CPU would be inherently radiation hardened since discrete transistors are a lot bigger than the ones on a chip, and thus less vulnerable to stray photons addling their state. But it would also be much too heavy to fly into space. When will people start to 3D-print transistors? I wish I could give a skull to your comment. Oh, how about “very soon” because that is one potential outcome of this work, http://hackaday.com/2016/05/14/hackaday-prize-entry-diy-ceramic-pcbs/ if the “inks” used come from a set of contuctor, semiconductor, insulator types. Then you just need to source raw materials and not buy components at all. I’d expect a size reduction of x10 or better too. But seriously: this is very impressive and the perfect example of a “we do it because we can” project. I wish I could go to the Maker Faire to see it in person. why dont you just dig a really big hole in your backyard by hand for the next 2 years. At least you turn it into a something useful like a swimming pool. You know what kind of a community Hackaday is, right? Yeah, a community with people that have a lot of time on their hands to do pointless things? I would love a new wheel! When you ‘reinvent’ something, it’s to learn from. And it looks awesome. And he could probably make more money selling it to one us than another backyard pool. Haters gonna hate… Makers gonna make. Why Breathe? Tons of people have done it before, and sure at least 1 person has done it better than you, so why Bother? But seriously, the education alone is worth the effort. I wish I had the mental endurance to see something like this through…. If you’re so convinced of the value of the education to be had (at the expense of the time spent – hey, nothing comes for free…) shouldn’t you be busy building one of these yourself…? Exactly, wouldn’t it be better to spend the time learning and doing a variety of other more useful things? Maybe spending the time getting a college degree? . So what problem does this solve? Breathing isn’t a good analogy because we have to do it. Somehow I think it would be useful if this guy would learn a more modern day architecture and develop something unique. Why doesn’t he build a Model T engine from scratch? Solving a problem that doesn’t exist. Why build teaching skeletons for doctors? Because it’s easier to explain the bones looking at it than imagining them under a person’s exterior. If nothing else it provides an excellent visual example of an extremely well documented processor for future engineers to learn on. It’s one of the largest processors practical to provide it with, too. This is really impressive. I’ve always through having a discrete CPU like this would be the ULTIMATE teaching tool. Being able to step through execution and probe any point in the design is a perfect thing for a computer architecture class. Amazing! It’s actually a sensible way to tackle the design. What interests me is how he will handle the “might makes right” logic where instead of using tri-state logic, when one signal is more important than another both are allowed on the bus at the same time but the more important signal has bigger transistors to swamp the less important one. This is one of the things Visual6502 discovered that nobody remembered about the original design. OUCH! No wonder they got away with so few transistors. That’s just horrible! Can’t have done power consumption or heat any good. WOW! Is there more to say saw the 6502 at the Hack-a-day after party. Eric is pure genius. What will you do next? So if you build a modern pc processor (assuming 3E9 transistors) in this way on circuit boards the size of my apartment (45m^2) and a distance of 1cm between them it would be a stack over 18 meters high. NOW MAKE A SID CHIP.